Beyond its role as a regulator, the New York state government has a critical function in the state’s construction industry: one of its largest customers. With a 2018 fiscal year capital budget of $14.5 billion, the policies and practices of the state government—as a consumer—significantly influence local construction labor markets. This presumably puts state lawmakers in the difficult position of having to balance two ethical considerations that, on the surface, appear to be mutually exclusive: the need to minimize taxpayer costs against the responsibility of ensuring fair wages, benefits, and safe working conditions for its residents on public construction projects. To ensure that New York state fulfills the latter consideration, contractors working on state-funded government construction projects must adhere to the tenets of New York’s prevailing wage law. Enacted in 1897, this state policy requires that contractors pay their workers no less than the “prevailing” wage and benefit levels within the local construction market. In addition to its ethical underpinnings, the law also has an economic justification: it protects New York construction workers from being undercut by low-wage, often out-of-state contractors that may covet a large government construction contract and whose presence would take away jobs and erode working conditions for local residents. State prevailing wage laws across the country have increasingly been assailed by those who appeal to lawmakers’ other responsibility—minimizing taxpayer costs—in an attempt to weaken or repeal these policies. These nationwide campaigns are built almost entirely upon a single argument: higher wages must equate to higher taxpayer costs. This narrative is simple, and its simplicity has made it a powerful political position that has been successfully exploited to overturn state laws in Indiana (2015) and West Virginia (2016). And with a recent publication by the Empire Center (McMahon and Gardner 2017), it has become apparent that some in New York will attempt to pitch the same narrative to state lawmakers. There’s one problem. According to the most advanced economic research on state prevailing wage laws, the simple narrative largely isn’t true. To separate fact from fiction as it relates to New York’s prevailing wage law, this report provides a thorough cost-benefit analysis of state policy relying extensively on independent, peer-reviewed research. As summarized in this report, academic economists from around the country have made prevailing wage laws a research priority over the last 15 years. In study after study, economists have found no evidence that these laws have had any significant cost effects on the biggest drivers of New York’s capital budget: highways and institutional buildings (e.g., schools). How could the simple narrative be so wrong? It turns out that the narrative relies on a subtle, yet egregious, logical fallacy that assumes that the only way that a contractor can minimize labor costs is by reducing the cost per hour of each worker. This is false. In any industry, an employer can also minimize labor costs by reducing turnover and/or the number of labor hours required. In construction, this would mean using higher wages to attract and hire the industry’s most productive workers and providing them with the most advanced equipment and technology. This high-wage, high-skill approach to minimizing cost is referred to as paying “efficiency wages,” a well-established strategy that is discussed in any introductory labor economics course. In the retail industry, this approach is what allows high-wage Costco and Wegmans to compete with low-wage Wal-Mart. Both paths can minimize costs, and it has been demonstrated convincingly in the academic research that high-wage contractors are able to exploit these cost offsets to place bids on public construction projects that are competitive with—if not better than—those of low-wage contractors. In short, opponents of prevailing wage laws have shaped the political narrative surrounding these laws by, in part, successfully creating and defeating an implicit straw man argument that prevailing wage laws increase the hourly cost per worker. That may be true. But the fundamental policy question is whether state prevailing wage laws increase total construction costs. From this perspective, the academic literature is clear and unequivocal: state prevailing wage laws have no effect on the biggest drivers of a state’s construction budget. Suggestions to the contrary, as found in reports authored by the laws’ opponents, consistently (and conveniently) ignore the academic research and instead rely on an empirical methodology that has been widely discredited among economists. Opponents of state prevailing wage laws across the country have also shaped the narrative on these laws by focusing almost entirely on the presumed costs of the policy; recent analyses of New York’s policy by the Center for Urban Real Estate (Vitullo-Martin 2012) and the Empire Center (McMahon and Gardner 2017) follow a similar approach. This single-minded focus on construction costs has altered political discussion about prevailing wage laws in a powerful way: it has obscured all attention away from the benefits that these laws offer a state and its residents. That is unfortunate, as state prevailing wage laws have been demonstrated to improve the lives of workers, communities, contractors and construction consumers. First and foremost, New York’s prevailing wage law strengthens and protects the state’s blue-collar middle class. By ensuring that New York state residents working on public construction projects receive fair pay and benefits, state lawmakers are directly responsible for creating and promoting the types of blue-collar middle-class jobs that have long represented the backbone of communities throughout New York state. This not only brings economic and personal security to New York families and communities, but it also adds hundreds of millions of dollars to the state’s economy and substantially increases New York’s state and local tax revenues. New York’s prevailing wage law is also one of the few effective policy levers that promote a clear pathway to the middle class for non–college educated workers. 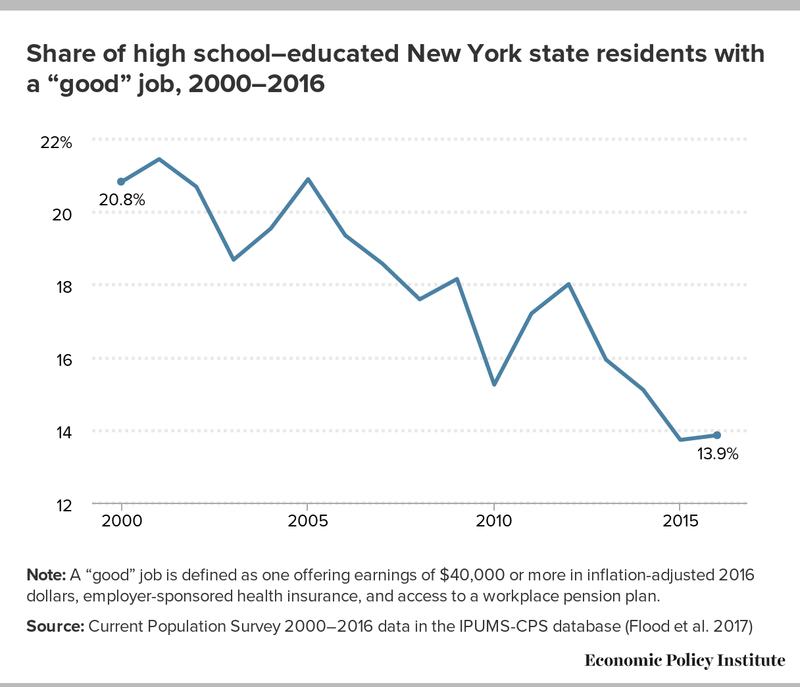 As described in this report, New York state residents without a college degree have encountered dwindling economic opportunities in recent decades, and most jobs expected to become available to them in the near future offer poverty-level wages or below. A career in construction is an exception, as this is one of the few remaining industries where workers can earn a sufficient paycheck and receive health and pension benefits without a college degree. New York’s prevailing wage law promotes these middle-class career opportunities by incentivizing contractors to hire apprentices enrolled in state-sanctioned programs, many of which only require a high school diploma for admission. In doing so, state lawmakers are directly providing opportunities for inexperienced workers to acquire the on-the-job training necessary to develop into skilled tradespeople and the next generation of New York’s blue-collar middle-class. The benefits of lawmakers’ support for apprenticeship programs through New York’s prevailing wage law also extend to the state’s contractors and construction consumers. Contractors have bemoaned skill shortages in construction for decades. While bona fide regional skill shortages can typically be resolved by increasing wages, contractors’ oft-used solution to a perceived skill shortage—recruiting and employing available out-of-region workers—represents a missed opportunity for policymakers interested in generating new jobs for local residents. Prevailing wage laws are one of the few effective policy levers available to promote on-the-job training and apprenticeships, thereby developing a skilled, in-state labor force capable of powering New York’s economic growth. New York’s prevailing wage law is also consistent with the obligation of state and local governments to prioritize the bids of honest, fair-dealing contractors whose workplace practices adhere to labor and employment law. Under the policy, contractors working on state-funded projects must submit a project-wide certified payroll report that includes employees’ names, Social Security numbers, pay rates, and number of hours. The prospect of more stringent government oversight discourages bids from unscrupulous contractors whose competitiveness depends on illegal, but-cost saving labor strategies. By rooting out unethical actors, prevailing wage laws also advantage contractors with a greater commitment to workplace safety, as the academic research demonstrates that fatal and nonfatal injury rates in construction are substantially lower in states with these laws. In sum, state lawmakers overseeing New York’s construction industry must weigh two ethical responsibilities that, on the surface, appear to be mutually exclusive: the need to minimize taxpayer costs and the responsibility of ensuring fair wages, benefits, and safe working conditions for its residents on public construction projects. A critical review of the current academic research in this report indicates that New York’s prevailing wage law may offer policymakers the opportunity to fulfill both responsibilities. On the biggest components of the state’s construction budget, the consensus of academic studies is that the policy has little to no effect on taxpayer costs. There is also considerable evidence that the policy raises the standard of living of a state’s residents, improves workplace safety, and offers a clear path to the middle class for New York state residents without a college degree. Taken together, research by independent, academic economists indicates that New York’s prevailing wage law is a uniquely valuable component of state policy that simultaneously uplifts residents and communities while imposing minimal, if any, cost on taxpayers. Beyond its role as a regulator, the New York state government has a critical function in the state’s construction industry: one of its largest customers. With a 2018 fiscal year capital budget of $14.5 billion, the policies and practices of the state government—as a consumer—significantly influence local construction labor markets. This presumably puts state lawmakers in the difficult position of having to balance two ethical considerations that, on the surface, appear to be mutually exclusive: the need to minimize taxpayer costs against the responsibility of ensuring fair wages, benefits and working conditions for its residents on public construction projects. To ensure that New York state fulfills the latter consideration, contractors working on state-funded government construction projects must adhere to the tenets of New York’s prevailing wage law. Enacted in 1897, this state policy requires that contractors pay their workers no less than the “prevailing” wage and benefit levels within the local construction market. In addition to its ethical underpinnings, the law also has an economic justification: it protects New York construction workers from being undercut by low-wage, often out-of-state contractors who may covet a large government construction contract and whose presence would take away jobs and erode working conditions for local residents. As states have continued to struggle to balance their budgets following the Great Recession, opponents have increasingly appealed to lawmakers’ other responsibility—minimizing taxpayer costs—in an attempt to weaken or repeal prevailing wage laws. These nationwide campaigns are built almost entirely upon a single argument: higher wages must equate to higher taxpayer costs. This narrative is simple, and its simplicity makes it a powerful political position. The argument is indeed simple. But is it true? It turns out that the simple narrative is too simple. An emerging consensus from the academic research reveals that, for many public construction projects, prevailing wage laws do not increase taxpayer costs (Duncan and Ormiston 2018). If this seems counterintuitive, consider that the simple wage-cost narrative ignores basic dynamics within construction markets: high-wage contractors attract and employ the highest skilled and most productive workers while using the industry’s most advanced equipment and technology. These labor cost offsets are substantial and allow high-wage contractors to place bids for public construction projects that are competitive with—if not better than—those of low-wage, low-skill contractors (Atalah 2013a). Whether prevailing wage policies allow state lawmakers to simultaneously fulfill both of their ethical obligations—to taxpayers and workers—represents a complicated public policy question. While the academic research cited above suggests that it does, any definitive conclusion about the answer for New York requires a more thorough examination of the state’s prevailing wage law than has been provided elsewhere. This report offers a detailed analysis of the broad array of costs and benefits of state prevailing wage laws in the context of New York’s state capital budget, emphasizing the findings of academic, peer-reviewed research. Nationwide political campaigns by opponents of state prevailing wage laws are typically accompanied by partisan reports featuring projections about how much a state will save by repealing the policy. These estimates are typically enormous. Political efforts to weaken the law in New York state are no different, as a 2017 report by the Empire Center proclaims that the state’s prevailing wage law is costing New York taxpayers an extra $400 million annually (McMahon and Gardner 2017). However, when viewed through the lens of the most advanced academic research, it becomes clear that these reports are methodologically defective and offer estimated cost savings that are wildly optimistic. New York State is projected to spend $5.6 billion on highways, bridges, and other transportation projects in fiscal year 2018, accounting for nearly 40 percent of the state’s capital budget. The Department of Transportation will oversee construction projects whose value will be more than four times that of any other state agency. As a result, any argument that prevailing wage laws substantially increase the state’s construction budget is severely weakened if it is shown that the policy has no impact on transportation spending. This is exactly the conclusion reached by Duncan (2015a), the definitive academic study on the relationship between prevailing wage laws and transportation spending. In an analysis of highway maintenance costs in Colorado between 2000 and 2011, the author discovered that resurfacing projects on state-funded intrastate highways and federally funded interstate highways were required to be built to identical standards. Contractors bidding on interstate projects, however, encountered one additional requirement: federal prevailing wage law (i.e., the Davis-Bacon Act).2 In contrast, intrastate projects were exempt from prevailing wage policy since Colorado had never passed such a law to govern state-funded construction. This created a perfect “natural experiment” for the author to examine the cost impact of prevailing wage. The evidence offered by the academic research on school construction suggests that state prevailing wage laws do not affect taxpayer costs in this area. For New York, the implications of this conclusion are far-reaching. In addition to the $589 million that the state is projected to spend on K-12 public school construction projects in fiscal year 2018, it would be reasonable to expect that these findings would also be applicable for construction work on comparable institutional projects; this would most specifically include the $1.5 billion that the state has set aside for higher education, which accounts for over 10 percent of its capital budget. Finally, this research is likely to be of considerable interest to local governments that devote a considerable portion of their capital budget to K-12 construction spending and require contractors to pay their workers a prevailing wage on city-funded projects. This certainly extends to New York City, whose fiscal year 2018 capital budget includes $3.4 billion for K-12 school construction projects. In November 2016, New York Governor Andrew Cuomo announced a deal between real estate developers and union construction officials that revived the state’s 421a tax exemptions for new construction of affordable housing in New York City. The controversial, long-awaited Affordable New York Housing Program provides developers with a 35-year tax abatement on housing projects. In return, developers must set aside a certain proportion of affordable apartments for 40 years and agree to pay construction workers an average compensation package of $45 or $60 per hour depending on the project’s location in NYC. Developers are not required to employ union labor. In sum, the current research on prevailing wage laws suggests that the policy likely increases construction costs on affordable housing. But the application of this research to make projections about the Affordable New York Housing Program is complicated by the fact that its required compensation—$45 or $60 per hour depending on the location—is substantially less than the wage and benefit requirements of federal and state prevailing wage laws for those areas. This renders direct comparisons to the effect of the federal Davis-Bacon Act—such as those made in the NYC IBO study—to be ineffective as cost estimates of Governor Cuomo’s program. It should not come as a surprise that prevailing wage laws likely have a different cost effect for affordable housing when compared with other areas of construction. There are likely two critical reasons for this. First, Dunn, Quigley, and Rosenthal (2005) noted that affordable housing construction requires less skill, has lower costs of materials, and features a larger share of labor in total costs when compared with other publicly funded projects. This position is consistent with the behavior of high-wage contractors, who have traditionally avoided residential construction projects; it is likely that these contractors have found that high-wage workers are less cost-effective on residential properties when compared to more complicated industrial or institutional projects. As a result, the assertions of Dunn, Quigley, and Rosenthal (2005)—combined with the near unanimous research on highways and institutional buildings (i.e., schools)—suggest that the positive cost effect of prevailing wage may be limited to affordable housing and related areas of construction. But there is another reason why prevailing wage laws might increase costs on affordable housing projects: it significantly disadvantages contractors who rely on illegal, but cost-saving, employment practices to remain competitive. These are hardly isolated practices in the construction industry. Audits by the New York State Department of Labor Unemployment Insurance Division between 2002 and 2005 revealed that 14.9 percent of construction employers misclassified employees—nearly 50,000 of them annually—as independent contractors (Donahue, Lamare, and Kotler 2007). Unscrupulous contractors often use this strategy as a means of evading legally required Social Security taxes and payments to the state unemployment insurance fund, robbing workers of their rightfully earned benefits and costing New York state tens of millions of dollars annually in lost UI funding. In addition to employee misclassification, numerous studies have shown that the construction industry in New York City is rife with contractors who engage in wage theft, hire undocumented labor, and ignore unsafe working conditions (Bernhardt, Spiller, and Polson 2013; Milkman, Gonzalez, and Ikeler 2012; Theodore, Valenzuela, and Melendez 2006). These issues are especially relevant when discussing the effect of prevailing wage laws on the construction costs of affordable housing; the Brennan Center for Justice (2007) noted that these illegal labor practices are especially concentrated in the residential sector of the construction industry. Prevailing wage laws help minimize these illegal labor practices. Consistent with similar laws across the country, the Affordable New York Housing Program requires contractors working on state-funded projects to submit a project-wide certified payroll report; this includes employees’ names, Social Security numbers, pay rates, and number of hours. The prospect of stringent government oversight of a project’s payroll provides a substantial disincentive for contractors whose low-cost bids for public works rely on cutting corners in their employment practices. At this point, there is not a definitive research study that indicates whether the Affordable New York Housing Program will increase construction costs on state-funded affordable housing. But if it does, would it be worth it—economically and ethically—for the state government to repeal the program and instead save money by rewarding contractors whose lowest bids are predicated on illegal but cost-saving employment practices? The most advanced, sophisticated research on prevailing wage laws in the United States yields no evidence that state policy increases construction costs on two of New York’s largest public expenditures: highways and schools. This consensus among academic economists, however, has not deterred non–peer reviewed reports from claiming that New York’s prevailing wage law substantially increases public construction costs in the state. The Citizens Housing and Planning Council (Roistacher, Perine, and Shultz 2008) estimated that the state law increased construction costs by 25 percent. The Center for Governmental Research (Gardner and Ruffer 2008) suggested that the law increased construction costs between 19 percent and 55 percent depending on the region. Most recently, the Empire Center (McMahon and Gardner 2017) estimated that these regional effects were anywhere between 13 percent and 25 percent. In the context of the academic research, these cost estimates do not make much sense. If the most advanced research suggests that prevailing wage laws do not affect construction costs on the key drivers of the state’s construction budget, how are these reports generating such enormous cost estimates? A review of these three studies—and similar anti-prevailing wage articles published around the country—reveals that these reports universally rely on variants of the same empirical methodology. This approach involves a simple two-step process that can best be explained by example. Consider the 25 percent estimate offered by the Citizens Housing and Planning Council (Roistacher, Perine, and Shultz 2008). The first step in the process is to compare the per-hour compensation required by prevailing wage law to some arbitrary, lower wage and benefit level. The CHPC, for instance, estimated that the median union construction worker in New York City earned 74 percent more in wages and fringe benefits than the median nonunion construction worker, an inflated and misleading number given that union workers operate almost entirely in the higher-wage nonresidential sector of the industry. In the second step, this per-hour compensation differential is multiplied by the proportion of construction costs attributable to labor expenses; the resulting product is touted as the “cost” of a state’s prevailing wage law. Given that the CHPC estimated that one-third of public projects’ construction cost was attributable to labor, the authors multiplied 74 percent by 33 percent to produce their final estimate: a 25 percent cost increase. This approach is mathematically simple. But it also violates the laws of economics. In any industry, an employer can minimize labor costs by either lowering the cost per hour or by reducing turnover and/or the number of labor hours. Construction contractors are no different. Some contractors minimize costs by following the first path, offering substandard wages and employing teams of relatively unskilled laborers. Other contractors pursue the latter route, hiring and retaining the industry’s most productive workers at higher wages and providing them with the most advanced equipment and technology. This is a well-known approach in labor economics called “efficiency wages”; in the retail industry, this strategy is what allows high-wage Costco and Wegmans to compete with low-wage Wal-Mart. Both paths can minimize costs, and it has been demonstrated convincingly that high-wage contractors in the construction industry are able to exploit these cost offsets to place bids on public construction projects that are competitive with—if not better than—those of low-wage contractors (Atalah 2013a, 2013b). With this background in mind, consider that the empirical methodology used by anti-prevailing wage studies relies entirely on a comparison between the prevailing wage and some arbitrary lower wage. This demonstrates that, all else equal, prevailing wage laws are associated with a higher hourly cost per worker. This may be true, but beware of the straw man argument at play: the policy-relevant question is whether prevailing wage laws increase overall construction costs, not the hourly cost per worker. Studies using this approach ignore, or conveniently dismiss, high-wage contractors’ ability to minimize labor costs in any other way besides reducing per-hour compensation; as an example, see the report from the Empire Center (McMahon and Gardner 2017, 9). This represents a significant methodological oversight that artificially inflates the cost estimates associated with the policy and violates the basic tenets of labor economics. Given evidence that high-wage contractors in New York state employ more experienced, more educated and better trained workers (see Appendix B), it is unfortunate that this flawed approach has already influenced public debate over prevailing wage laws in the state. Part of this, however, may be due to a lack of clarity about the shortcomings of this methodology. Given its prevalence among anti-prevailing wage studies, the Citizens Housing and Planning Council (Roistacher, Perine, and Shultz 2008) gave equal standing to the simple, two-step approach—which they deemed the “hypothetical” cost model—when compared to the econometric, regression-based model employed in the academic literature; the New York City Independent Budget Office (2016) later incorporated the CHPC’s perspective into its report. These two approaches, however, are not on equal standing among empirically rigorous economists and researchers. As outlined in Duncan and Ormiston (2018), the “hypothetical” approach—sometimes called the “wage differential” method—has been widely discredited in academic circles. As evidence, consider that there has not been a single known research paper accepted for academic publication in the last 16 years that has employed this simple approach in an evaluation of prevailing wage laws; every published study has instead relied on regression modeling. This latter approach is preferred among researchers given that it evaluates overall construction costs in a manner that is agnostic about a contractor’s method of minimizing costs, thereby allowing an unbiased evaluation of the cost impact of state prevailing wage laws. Those opposed to prevailing wage laws have armed themselves with a simple, yet powerful, political narrative that higher wages must mean higher construction costs. They have supported their position with an equally simple empirical methodology that relies entirely on the assumption that prevailing wage laws must increase taxpayer costs. Following this well-worn playbook, opponents in New York have used this simple ideology to promise taxpayers hundreds of millions of dollars of savings if the state repealed this long-established policy. Simple arguments can produce politically powerful narratives. But cost estimates of state prevailing wage laws based on opponents’ simple methodology is the economics equivalent of trying to build a new hospital using only a hammer and a hand saw. As any construction contractor or worker can appreciate, more complicated problems often require more complex tools. Fortunately, academic economists—using more advanced empirical tools—have made estimating the cost impact of state prevailing wage laws a research priority in recent years. When viewed through the lens of New York state’s capital budget, the most advanced research offered by these economists indicate that opponents’ estimated cost impact of the state’s prevailing wage law is substantially overblown. Peer-reviewed studies have offered clear evidence that these laws have no significant cost effect on the biggest drivers of New York’s capital budget: highways and institutional buildings (e.g., schools). There is evidence that prevailing wage laws may increase construction costs on affordable housing, but the effect may be limited to residential construction and the unique characteristics of the Affordable New York Housing Program clouds the applicability of existing research to estimate the policy’s cost. In sum, when research on prevailing wage laws is considered in the context of New York state’s capital budget, the results suggest that the policy has minimal effect, if any, on public construction costs. Recent analyses of New York’s state prevailing wage law by the Center for Urban Real Estate (Vitullo-Martin 2012) and the Empire Center (McMahon and Gardner 2017) have focused almost entirely on the presumed costs of the policy. This single-minded focus on construction costs—consistent with political campaigns to repeal state policies around the country—has altered the narrative about prevailing wage laws in a powerful way: it has obscured all attention away from the benefits that these laws offer a state and its residents. That is unfortunate, as prevailing wage laws are one of the few, effective policy levers available to lawmakers to improve the standard of living of blue-collar workers, promote a skilled workforce, and provide an established pathway to the middle class for New York residents without a college degree. Note: Data are for four of the 23 major groups in the Standard Occupational Classification (SOC) system. SOC groups include all industries. Note: Earnings are adjusted using Consumer Price Index for Northeast Region. One of the first lessons in any introductory macroeconomics course is that when workers earn higher wages, a region’s economy will grow. Not only does the worker (and their family) improve their standard of living, but their subsequent spending of these gains ripples through the economy to create economic growth through the “multiplier effect.” This basic set of economic principles has been overlooked in previously published analyses of New York’s prevailing wage laws. This oversight is unfortunate, as the repeal or weakening of New York’s prevailing wage policy—and the subsequent reduction in worker wages in construction—would damage the economic outlook for thousands of state residents, their families, and their communities. 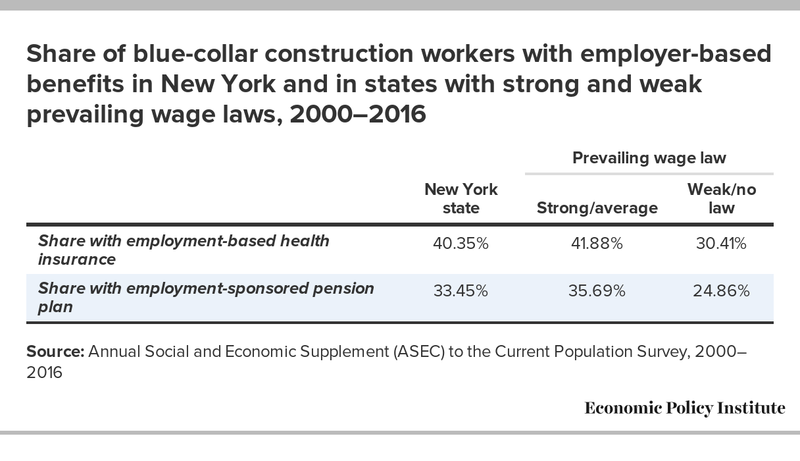 As an estimate, Table 2 analyzes New York’s blue-collar construction labor force and the statewide earnings losses that would be attributable to the repeal of the state’s policy. 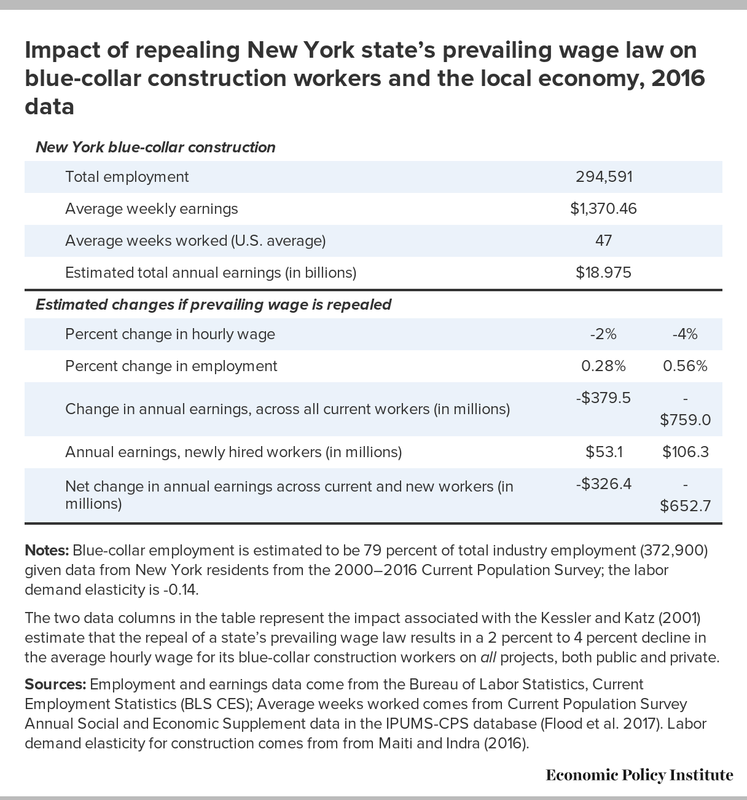 Given the findings of Kessler and Katz (2001), Table 2 examines how 2 percent and 4 percent reductions in the average hourly wage of New York’s blue-collar construction workers would impact the state’s economy. Notes: Blue-collar employment is estimated to be 79 percent of total industry employment (372,900) given data from New York residents from the 2000–2016 Current Population Survey; the labor demand elasticity is -0.14. The two data columns in the table represent the impact associated with the Kessler and Katz (2001) estimate that the repeal of a state’s prevailing wage law results in a 2 percent to 4 percent decline in the average hourly wage for its blue-collar construction workers on all projects, both public and private. Sources: Employment and earnings data come from the Bureau of Labor Statistics, Current Employment Statistics (BLS CES); Average weeks worked comes from Current Population Survey Annual Social and Economic Supplement data in the IPUMS-CPS database (Flood et al. 2017). Labor demand elasticity for construction comes from from Maiti and Indra (2016). 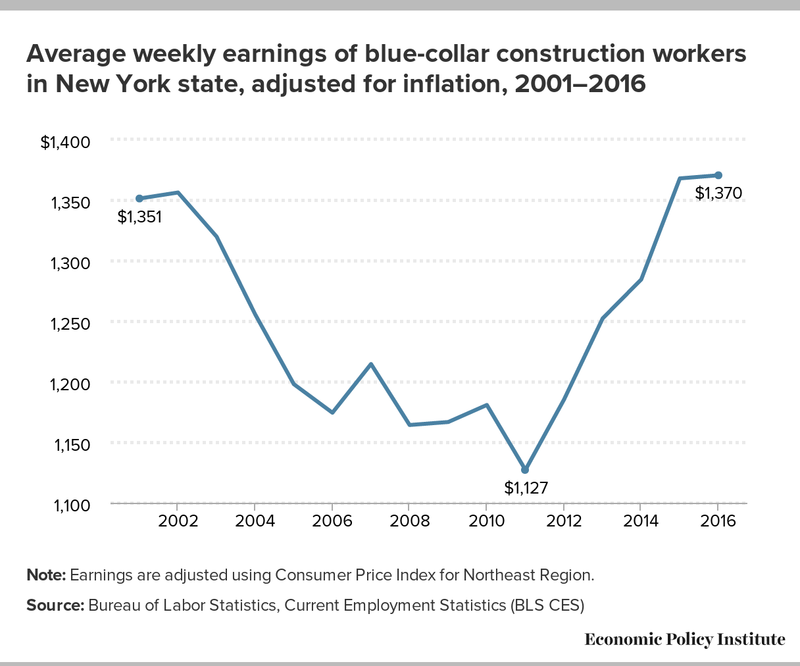 As presented in Table 2, it is estimated that blue-collar construction workers in New York state earned a total of $18.975 billion in earnings in 2016. If New York’s prevailing wage policy was repealed and the average industry wage fell between 2 percent and 4 percent, this would equate to earnings losses between $379.5 million and $759.0 million. These earnings losses would only minimally be offset by increased hiring attributable to lower industry wages, as Maiti and Indra (2016) estimate the wage elasticity of labor demand in construction is just -0.14. This would indicate that the earnings of newly hired employees would be between $53.1 million and $106.3 million.18 On net after repeal, aggregate earnings by blue-collar construction workers in New York state would decline by between $326.4 million and $652.7 million. This decline would not only distress New York state residents employed in these jobs, but their subsequent reductions in spending would ripple through the state’s economy.19 Short of repeal, the earnings impact of policy weakening would depend on the particulars of the proposal; it is nevertheless obvious that any policy movement in that direction would have a significant and deleterious effect on New York’s economy. Any statewide loss of income attributable to the repeal or weakening of the New York’s prevailing wage law will also result in lower tax revenues for state and local governments. Using the figures estimated in the previous section, Table 3 projects the additional state sales and income tax revenues that are produced by the state’s prevailing wage policy directly from the increase in net earnings among blue-collar construction workers in the state. Given that a significant portion of New York state residents’ incomes are spent on items exempt from the state sales tax (4 percent), this study estimates the increase in state revenues from the sales tax by comparing the state’s annual sales tax revenues to its aggregate level of personal income (via the Bureau of Economic Analysis) annually between 2011 and 2016. That ratio—1.06 percent—has been stable year over year, indicating that the increase in the incomes for blue-collar construction workers in New York attributable to prevailing wage laws results in an additional $3.5 million to $6.9 million in sales tax revenue.20 Given that the median local sales tax in New York is also 4 percent, it would be expected that prevailing wage laws would have a comparable impact on local tax revenue. Notes: The two data columns in the table represent the impact associated with the Kessler and Katz (2001) estimate that the repeal of a state’s prevailing wage law results in a 2 percent to 4 percent decline in the average hourly wage for its blue-collar construction workers on all projects, both public and private. Sources: Aggregate annual state sales tax data from the New York State Department of Taxation and Finance. Aggregate personal income for New York state from the Bureau of Economic Analysis. Ratio of after-credits state tax liability and family income for 2000–16 estimated from variables provided by the Annual Social and Economic Supplement (ASEC) to the Current Population Survey. Blue-collar construction workers account for nearly 7 percent of New York state’s “working poor,” as there are an estimated 25,500 workers in the state employed in construction whose standard of living is below the poverty line.23 Substandard wages in some sectors of the industry are exacerbated by regular unemployment stints due to insufficient construction demand because of the weather or the health of the economy. Repealing or weakening the state’s prevailing wage law will likely make this problem worse. Table 4 shows that poverty among construction workers is far worse in states with weakened or nonexistent prevailing wage laws. In New York, the results indicate that 8.36 percent of blue-collar construction workers were living below the poverty line. This is comparable to the 8.14 percent among all states—like New York—with a “strong” or “average” prevailing wage law.24 However, in states with a “weak” or nonexistent prevailing wage law, 10.68 percent of blue-collar construction workers live in poverty. In a time of instability in health insurance markets, state prevailing wage laws are one of the few public policies available to directly promote employment-based health insurance. Contractors working on state-funded projects are mandated under the law to compensate workers with the prevailing rate of fringe benefits in the area. As demonstrated in Table 5, blue-collar construction workers in states with a strong or average prevailing wage law—including New York—have substantially higher rates of employment-based health insurance (41.88 percent) than comparable workers in states with weak or nonexistent policies (30.41 percent). Although there may be a number of contributing factors to this outcome, the compensation mandates included in state prevailing wage laws are directly responsible for at least part of this differential. Any weakening of New York’s prevailing wage law would therefore impose considerable social and economic costs on the workers and their families who would lose their health insurance as a result of this change in state policy. In addition to health insurance, the fringe benefit package required of contractors working on state-funded projects typically includes payments into an employer-sponsored pension fund. As presented in Table 5, the mandates included in prevailing wage laws directly contribute to higher rates of workplace pensions among blue-collar construction workers in states with a strong or average prevailing wage law (35.69 percent) when compared with states with a weak or nonexistent policy (24.86 percent). Increased wages attributable to prevailing wage laws also help workers accrue larger Social Security accounts, further strengthening their retirement security. Finally, requirements that contractors working on state-funded construction projects must submit a certified payroll to regulators help ensure that employees will not be misclassified as independent contractors. Being correctly classified as an employee requires the firm to pay the employer portion of Social Security taxes. Increased financial security at retirement is of critical concern given that blue-collar construction workers often retire with more physical limitations than those who were employed in other sectors of the economy, and prevailing wage laws are one of the most effective policy levers that lawmakers can utilize to improve their economic situation upon retirement. Note: A “good” job is defined as one offering earnings of $40,000 or more in inflation-adjusted 2016 dollars, employer-sponsored health insurance, and access to a workplace pension plan. 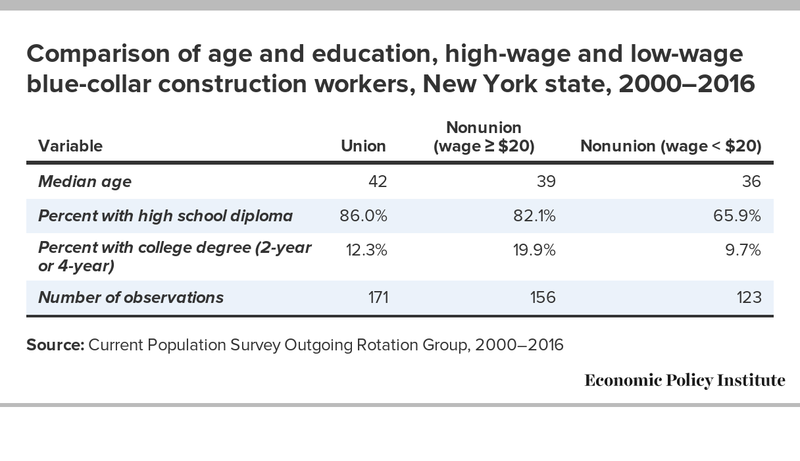 The economic plight of non–college educated workers in New York is only projected to get worse, as most of the jobs that will become available to these individuals through 2024 are likely to feature poverty-level wages or below. To demonstrate this, Table 6 documents the six fastest-growing occupations on a national basis for which at least 50 percent of job incumbents in New York do not have a post-secondary degree. The fastest-growing occupational category—health care support—is expected to feature brisk job growth through 2024, however New York state residents in these positions earn an average income of $30,540. This isn’t enough to support a family, as the average salary in these positions is so low that it would qualify a family of four for food stamps in New York state.27 Residents employed in the second-fastest growing occupation for the non–college educated—personal care and services—earn an even lower income ($29,870). At these rates of pay, these are not the kinds of jobs that provide the personal and economic stability required for healthy New York residents, families and communities. 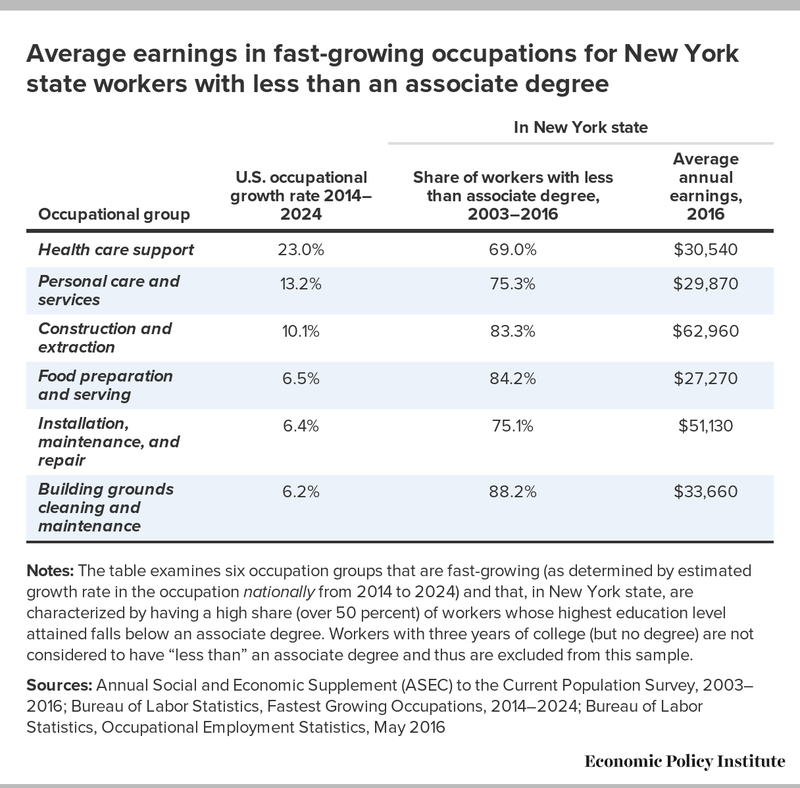 Notes: The table examines six occupation groups that are fast-growing (as determined by estimated growth rate in the occupation nationally from 2014 to 2024) and that, in New York state, are characterized by having a high share (over 50 percent) of workers whose highest education level attained falls below an associate degree. Workers with three years of college (but no degree) are not considered to have “less than” an associate degree and thus are excluded from this sample. There are, however, occupations—such as construction—that offer non–college educated workers a clear pathway to the middle class. As outlined in Table 6, demand for construction workers is expected to grow by 10.1 percent between 2014 and 2024, with the average New Yorker employed in the construction trades earning $62,960 as of last year. These kinds of jobs are what can rebuild—literally—New York’s middle class. New York state’s prevailing wage law is an important and effective policy lever that opens a pathway to the middle class for non–college educated residents. In addition to ensuring that experienced construction workers earn a middle-class income and receive benefits on state-funded projects, state prevailing wage laws also incentivize contractors to hire apprentices enrolled in a state-sanctioned program, many of which only require a high school diploma for admission. Under the law, contractors are able to compensate apprentices at a rate below the required prevailing wage. This motivates contractors to provide opportunities for inexperienced workers to acquire the on-the-job training necessary to develop into skilled tradespeople and the next generation of New York’s blue-collar middle-class. As highlighted by Bilginsoy (2005), Philips (1998) and Philips et al. (1995), repealing or weakening a state’s prevailing wage law will reduce apprenticeship opportunities. In a time of limited middle-class job opportunities for non–college educated New York residents, this would be an egregious mistake in this economy that would further exacerbate the decline of the state’s middle class. The construction industry—both nationally and in New York—is populated by a widely divergent set of contractors. On one hand, there are honest contractors who operate with transparency, in accordance with the law, and with the goal of doing right by their employees and customers. On the other hand, there are also unscrupulous contractors who engage in wage theft, exploit undocumented laborers, misclassify workers, evade tax payments (e.g., Social Security), and ignore unsafe working conditions. Construction firms whose profits depend on unethical actions are prevalent in New York (Bernhardt, Spiller, and Polson 2013; Donahue, Lamare, and Kotler 2007; Milkman, Gonzalez, and Ikeler 2012; Theodore, Valenzuela, and Melendez 2006), with many operating in sectors where there are numerous opportunities to bid on publicly-funded projects (Brennan Center for Justice 2007). The illegal, cost-saving actions of these unethical actors put New York’s honest contractors at a competitive disadvantage. The state’s prevailing wage law, however, helps level the playing field. Under the law, contractors working on state-funded projects must submit a project-wide certified payroll report that includes employees’ names, Social Security numbers, pay rates, and number of hours. The prospect of more stringent government oversight substantially discourages bids from contractors whose competitiveness is dependent on unlawful employment strategies. By rooting out unscrupulous contractors, prevailing wage laws help effectuate the moral obligation of state and local governments to prioritize the bids of honest, fair-dealing contractors whose workplace practices adhere to labor and employment law. Debate over public policy in the construction industry is complicated by its high rates of workplace injuries and jobsite fatalities; the industry was responsible for one in five job-related deaths in 2014.28 As lawmakers and construction consumers, government officials in New York have an ethical responsibility to ensure that state residents are not unduly imperiled while working on public projects. While prevailing wage laws typically do not include safety requirements, the elimination of low-road contractors from bidding on public projects results in an increased reliance on high-road contractors with a greater commitment to workplace safety and worker training. The results of these two studies demonstrate that, on net, prevailing wage laws do not affect the number of contractors bidding on public projects. But additional evidence suggests that prevailing wage policies may substantially advantage local, in-state contractors in the bidding process. In a non-academic review of 110 Ohio school construction projects open to bid between 2013 and 2016, Onsarigo et al. (2017) discovered that out-of-state contractors submitted the lowest bid on 21 percent (16 of 77) of projects that were not covered by prevailing wage law. In comparison, out-of-state contractors won just 3 percent (1 of 33) of the bids for projects that required prevailing wages to be paid. The effect of prevailing wage laws to advantage local contractors has yet to be examined in the academic press, however the results of Onsarigo et al. (2017) are consistent with the reasons why some prevailing wage laws were originally enacted. In addition to ensuring minimum labor standards, prevailing wage laws—including the federal Davis-Bacon Act of 1931—were designed to protect local contractors from being undercut by out-of-state firms relying on low-cost, low-road employment strategies that erode local labor market conditions (Gujarati 1967). Contractors have bemoaned skill shortages in the construction trades for decades (e.g., Weinberg 1969). The basic laws of supply and demand suggest that bona fide skill shortages in a particular region can typically be resolved by increasing wages. In construction, however, contractors are more often inclined to employ an alternative strategy when dealing with a perceived short-term skill shortage: recruiting and employing available out-of-region workers. This represents a missed opportunity for policymakers interested in generating new jobs for local residents, and the repeal of the state’s prevailing wage law—and the corresponding decline in industry wages—would only exacerbate the problem. Perceived skill shortages in the industry may exist because of the cyclical and seasonal nature of construction work and the resulting instability of the employment relationship. For many contractors, workers hired during times of high construction demand are quickly jettisoned once demand slows. This loose attachment between worker and employer suppresses the incentives for many contractors to incur the costs of training. Employers cannot ensure that they will retain employees that have benefited from potential training investments, and are discomforted by the likelihood that these workers will eventually be employed by competing contractors. Given frequent spells of unemployment (combined with relatively low wages in entry-level positions), individual workers often have insufficient resources to incur the costs of training themselves. In sum, the cyclical and seasonal nature of construction may lead to a less than optimal level of training in the industry. State prevailing wage laws are one of the few effective policy levers available to lawmakers to increase the number of skilled workers in construction. The policy’s compensation exemption for apprentices incentivizes contractors—both union and nonunion—to hire a fixed number of relatively inexperienced workers admitted to a state-sanctioned apprenticeship program to work alongside more skilled, experienced workers on a job site; this on-the-job training is critical for workforce development. The promotion of apprenticeship programs is amplified by state prevailing wage laws in other ways. For union contractors, a portion of most unions’ hourly compensation package sets aside a per-hour portion to be contributed to a joint union-management apprenticeship training fund that supports classroom instruction that trains the next generation of tradespeople available to all union contractors. Nonunion contractors seeking to bid on prevailing wage projects require a sufficiently trained workforce whose productivity and skill make higher wages economically viable and allow them to be competitive with union firms that traditionally have employed better-trained workforces. To incentivize this caliber of firm-based training and development, nonunion contractors require access to a sufficient number of projects requiring these skills unavailable to low-road, rival contractors; this ensures they will maintain enough labor demand to continue the employment of their skilled workforce and reap the benefits of training investments. The singular focus of public debate on construction costs ignores two other critical construction outcomes: quality craftsmanship and on-time completion. Poorly constructed bridges and long-delayed school openings can have disastrous consequences for New York families and communities. To date, most experts posit that prevailing wage laws—through its advantaging of high-road contractors employing the industry’s most skilled workers—lead to better construction quality and greater on-time completion (e.g., Philips 2014; Kelsay 2016). While these conclusions may follow logically from the other demonstrated benefits of prevailing wage laws, it should be noted that a lack of available data on quality and timeliness have limited academic researchers from empirically evaluating these hypotheses. The single-minded focus on costs by the Center for Urban Real Estate (Vitullo-Martin 2012) and the Empire Center (McMahon and Gardner 2017) has altered the public narrative about New York’s state prevailing wage law by obscuring the benefits that these laws provide to the state’s residents and communities. That is misguided, as there is considerable evidence that prevailing wage laws improve the standard of living for blue-collar workers, improve workplace safety, advantage in-state contractors, minimize illegal employment practices, develop worker skills, and provide a pathway to the middle class unavailable in other sectors for state residents without a college degree. Those who ignore the benefits of prevailing wage laws in framing public debate are, at best, offering a one-sided, incomplete depiction of the policy that does a disservice to New York’s blue-collar workers and the communities in which they reside. Those seeking to repeal or weaken state prevailing wage laws have been incredibly effective in recent years in shaping public and political opinion. Their approach has relied on (a) a singular focus on the costs of the policy and (b) an argument—higher wages mean higher taxpayer costs—whose simplicity and intuitiveness seems to powerfully resonate with lawmakers and residents alike. Opponents of prevailing wages have exploited this narrative in campaigns across the country, successfully convincing lawmakers to repeal state prevailing wage laws in Indiana (2015) and West Virginia (2016) and politically or effectively weaken these laws in many other states across the country. But there is a fundamental problem with the simple narrative that prevailing wage laws increase costs: the statistical evidence says otherwise. The cost of state prevailing wage laws has been a considerable focus of independent, academic economists over the last 15 years. In study after study, the results demonstrate a clear consensus: state prevailing wage laws have not been shown to increase taxpayer costs on the biggest components of state construction budgets (roads and schools). If this seems counterintuitive, consider that high-wage contractors employ the most skilled and most productive workers and use the industry’s most advanced technology and equipment; this allows them to place bids on public construction projects that are competitive with—if not better than—those of low-wage, low-skill contractors. Essentially, state lawmakers “get what they pay for” when it comes to hiring contractors and workers to build public construction projects. There is another fundamental problem with the current narrative on state prevailing wage laws: it entirely ignores the many benefits that the law provides a state’s residents and communities. In a time when economic opportunities for blue-collar workers are slipping away—devastating families and communities—prevailing wage laws are one of the few effective policies available to state lawmakers that increase the standard of living for these workers, incentivize employers to provide opportunities for training and skill development, and offer a clear pathway to the middle class for non–college educated state residents. Prevailing wage laws also advantage in-state and law-abiding contractors, reduce illegal employment practices, and improve workplace safety for a state’s residents. Any public discussion about state prevailing wage laws that ignores the benefits of the policy does an incredible disservice to a state’s workers, families, and communities. It is acknowledged that, in discussing New York’s prevailing wage policy, state lawmakers are faced with two ethical obligations that, on the surface, appear to be mutually exclusive: the need to minimize taxpayer costs against the responsibility of ensuring fair wages, benefits, and working conditions for its residents on public construction projects. From a review of the current academic research, it would appear that New York’s prevailing wage law potentially offers policymakers the opportunity to fulfill both responsibilities. On the biggest components of the state’s construction budget, the consensus of academic studies would be that the policy has little to no effect on taxpayer costs. There is also considerable evidence that the policy raises the standard of living of a state’s residents, improves workplace safety, and offers a clear path to the middle class for New York state residents without a college degree. In sum, research by independent, academic economists suggests that New York’s prevailing wage law is a uniquely valuable component of state policy that simultaneously uplifts residents and communities while imposing little, if any, cost on taxpayers. This report would be remiss without directly addressing the points raised by the Empire Center, which published a 2017 report (McMahon and Gardner 2017) critical of the state’s prevailing wage law and proposing a series of amendments to substantially weaken the policy. First, the authors generate cost estimates of New York’s policy using a variant of the widely discredited “hypothetical” approach discussed earlier in this paper. By comparing the level of prevailing wage with some arbitrary, lower wage level, the Empire Center does demonstrate that prevailing wages may increase labor cost per hour on some projects, if it assumes that the state government would have used a low-wage contractor instead of a high-wage contractor. But the authors commit a significant logical fallacy in blindly suggesting that this equates to showing that prevailing wages would increase total construction costs. “Efficiency wages” are a basic concept in labor economics, as it explains how firms using a high-wage, high-skill workforce can effectively compete with firms that employ low-wage, low-skill workers; in essence, this is how Costco and Wegmans are able to compete against Wal-Mart in the grocery industry. Within the construction industry, the productivity differential between high-skill and low-skill construction workers is substantial (Atalah 2013a, 2013b), which makes the authors’ explicit dismissal of productivity differences (McMahon and Gardner 2017, 9) to be, at best, puzzling. Lawmakers and residents should also be clear-eyed that many of the Empire Center’s basic arguments against the state’s prevailing wage law—beyond a cost estimate that relies on a discredited methodology—have little to do with the actual law itself. Instead, it seems that the authors’ strategy to undermine state policy is to explicitly connect the law to New York’s construction unions—evidenced, in part, by its cartoonish cover—and then, by proxy, discredit the policy by disparaging the unions. Besides the use of simple misdirection, this approach conceals two more logical fallacies. First, it is not clear that many of these critiques have any relationship with prevailing wage or construction costs. The Empire Center criticizes unions’ work rules and underfunded pensions, but increased job security stipulations and pension contributions are typically offset in collective bargaining through lower wage requirements.32 Second, and perhaps more importantly, the authors’ arguments rely on their implicit narrative that union contractors—and only union contractors—bid on prevailing wage projects (pg. 7). This is simply untrue. In fact, in the study of prevailing wage laws in California, Kim, Kuo-Liang, and Philips (2012) found that 26 percent of bidders on prevailing wage projects were nonunion contractors. Duncan (2015a) found similar results in Colorado, and there is nothing to suspect that things would be markedly different in New York state. Much of the Empire Center’s argumentation relied on the assumption that prevailing wage projects were the explicit domain of construction unions; evidence to the contrary calls into question their approach and, as a result, their conclusions. Russell Ormiston is associate professor of economics at Allegheny College and research scholar for the Institute for Construction Economic Research. Dale Belman is professor of labor relations and human resources at Michigan State University and president of the Institute for Construction Economic Research. Matt Hinkel is a Ph.D. Student, Labor Relations and Human Resources, Michigan State University. 1. The New York State Fiscal Year 2018 Enacted Capital Program and Financing Plan can be accessed at: https://www.budget.ny.gov/budgetFP/enactedfy18.html. 2. Bids for federally funded interstate projects also had to adhere to the requirements of the Disadvantaged Business Enterprise Program. However, given that the results of the study showed that the policies collectively had no effect on cost, it is highly unlikely that this latter policy is offsetting an undetected cost increase attributable to prevailing wage law. 3. The only other recent study of the effects of prevailing wage laws on transportation spending was Vitaliano (2002). Using data on all 50 states from 1996, the author used a sparse, six-variable regression model to link the presence of a state prevailing wage law with total expenditure by the respective state’s department of transportation. While the results suggest that prevailing wage increases state costs by 8 percent, the approach failed to include the most critical variables that predict total expenditure, such as the level of law enforcement staffing, number and scope of projects ordered, and so on. This debilitating omitted variable bias substantially weakens the paper to the point that it has questionable validity as a part of public policy discussion. 4. Concerns about the applicability of Colorado research to New York markets are attenuated by the fact that the two states seemingly have a comparable wage differential between high-wage and low-wage contractors, as presented in Appendix A. Given that data on individual contractors is not publicly available, this report instead used data from the Outgoing Rotation Group of the Current Population Survey between 2000 and 2016 to compile a reasonable sample size of blue-collar construction workers from Colorado and New York (n=498). Proxying union members as employed by high-wage contractors and nonunion members to be working for low-wage contractors, the results of a regression model on workers’ hourly wage does indicate that union members, as expected, are paid more (14.8 percent) on an hourly basis. However, the results indicate the union differential in New York is statistically indistinguishable from that of Colorado. While this approach is rife with caveats—e.g., the sample cannot separate residential from nonresidential workers, it relies on workers’ state of residence and not state of employment—it represents the best approach to compare the wage differential between high-wage and low-wage contractors across the two states. The results of the regression—and the nonsignificance of the union-state interaction term—offer preliminary evidence that contractors in New York state should be able to substitute low-wage workers with high-wage workers at a similar rate to those featured in the research on Colorado. 5. A complete summary of these studies is provided in Duncan and Ormiston (2018). The five academic articles are Bilginsoy and Philips (2000); Azari-Rad, Philips, and Prus (2002, 2003); Vincent and Monkkonen (2010); and Duncan, Philips, and Prus (2014). The four non-academic studies are: Prus (1999), the Ohio Legislative Service Commission (2002), Kelsay (2016), and Onsarigo et al. (2017). 6. The lone dissenting study—Vincent and Monkkonen (2010)—found results linking state prevailing wage laws to higher school construction costs, however their approach has been questioned given their failure to control for the cost effect of local economic conditions (Onsarigo et al., 2017). 7. The Ohio Legislative Service Commission (2002) report posited that the school construction exemption in the state’s prevailing wage law saved the state 10.7 percent; however this estimate was derived from three regression models in which none of the prevailing wage coefficients were even close to conventional levels of statistical significance. The decision to explicitly dismiss concerns over statistical significance is at odds with normal statistical practice as found in introductory econometrics textbooks, and has been criticized in multiple subsequent reports (Onsarigo et al. 2017; Duncan and Ormiston 2018). 8. In a follow-up study, Atalah (2013b) employed the same data set and approach but instead compared union and nonunion bids within each trade. While within-trade samples tended to be small, the study found no statistically significant difference between bids from union and nonunion contractors in 13 of the 18 trades studied. Of the five trades where there was a significant difference, three featured higher bids from union contractors while two demonstrated higher bids from nonunion contractors. 9. Dunn, Quigley and Rosenthal (2005) used two different types of regression methods—ordinary least squares and instrumental variables—to study the effect of prevailing wage laws on the construction costs of affordable housing. Under OLS, which was used by the NYC IBO study, the authors suggested that the cost effect was between 9 percent and 11 percent. Using instrumental variables, Dunn, Quigley and Rosenthal (2005) estimated that the cost impact was between 19 percent and 37 percent, however this approach was heavily critiqued by Mukhopadhyay, Harris and Wiseman (2013) and Littlehale (2017) for its use of weak first-stage instruments that inflated the estimates. 10. The Minnesota Office of the Legislative Auditor (2007) critiqued Dunn, Quigley and Rosenthal (2005) for their failure to consider the role of HUD requirements, thereby suggesting that their estimates may also be inflated. While the failure to properly control for other federal requirements—beyond prevailing wage—may complicate the research on affordable housing construction costs, these concerns are not as applicable when examining research on highways and schools. For the former, Duncan (2015a) specifically notes that the building specifications of state and federal highways are identical with two exceptions: federal prevailing wage and the requirements of the Disadvantaged Business Enterprise Program. In regards to schools, many studies examine the cost impact of prevailing wage by looking at costs before and after the onset or repeal of prevailing wage (e.g., the exemption of schools from Ohio’s prevailing wage law in 1997); this would minimize the influence of changes in complementary public policies. 11. While not published in academic press, a collection of California government agencies prepared a study that collected data on 400 affordable housing projects in the state from 2001 to 2011 (California Department of Housing and Community Development et al. 2014). Using regression analysis, the study estimated that prevailing wage laws increased construction costs by 11 percent, however the authors noted that the size and statistical significance of this estimate were particularly sensitive to the specification of the model. 12. Excluding year and region fixed effects, the NYC IBO study featured nine variables; in contrast, the two academic papers featured models that included nearly three times as many variables. Many of the variables included in the academic studies—but not in the NYC IBO report—were statistically significant, This includes, but is not limited to, data on profit/nonprofit status of the developer, architecture and engineering costs, parking characteristics (not just a dummy variable indicating whether parking was a part of the project), total number of units in the structure (not just the number of affordable units), and nonresidential components of the project. 13. A subsequent, non-academic study by Yildirim and Lee (2016) used the same methodology employed by the NYC IBO study to estimate how prevailing wage laws affect construction costs in affordable housing across each of New York City’s five boroughs for the same time period (2010 through 2015). The study’s reliance on the same regression model, however, exposes it to the same concerns as the NYC IBO paper. 14. While Kessler and Katz (2001) find that hourly wage declines are more concentrated among union workers following the repeal of a state’s prevailing wage law, their results demonstrate that wages for nonunion workers do not increase as a result. 15. Estimates between 2 percent and 4 percent provide conservative projections. In contrast, Kelsay (2016) cites a series of studies to use projections between 3 percent and 5 percent. 16. According to the Bureau of Labor Statistics, the average “production” worker in the construction industry earned $36.16 per hour and worked 37.9 hours per week in New York during 2016. While the BLS does not provide the average number of weeks worked—a critical issue given the on-again, off-again nature of construction employment—a 50-week work-year would result in the average blue-collar construction losing $2,056 assuming a 3 percent reduction in the hourly wage. 17. According to the Bureau of Economic Analysis, the real GDP for New York state in 2000 was $1,161.4 billion (2016 dollars). In 2016, the BEA estimated the state’s real GDP to be $1,488.0 billion, indicating a growth rate of 28.1 percent since 2000. 18. The conclusion that newly hired workers would earn between $53 million and $106 million is based on the assumption that these workers would be paid the industry average hourly wage. In all likelihood, new hires would be paid much lower, entry-level wages. Projections based on the industry average, however, are used as a means of being conservative in the estimates of the overall economic impact of the state’s prevailing wage law. 19. There are numerous reasons to believe that these estimates may be conservative. First, Onsarigo et al. (2017) discovered that bidding by out-of-state contractors substantially increased on Ohio school projects after the state excluded schools from prevailing wage. While this was based on a small sample (n=110) and was not a part of a peer-reviewed study, any increase in out-of-state contractors would take jobs—and income—away from New York workers, thus exacerbating earnings losses attributable to a potential repeal of the state policy. Second, in a non-academic study, Philips (2014) suggested that the decline in the average hourly wage of construction workers following the repeal of a state’s prevailing wage law may approach 8 percent; if that is true, that would nearly double the maximum earnings impact estimated for New York’s law in Table 2. 20. 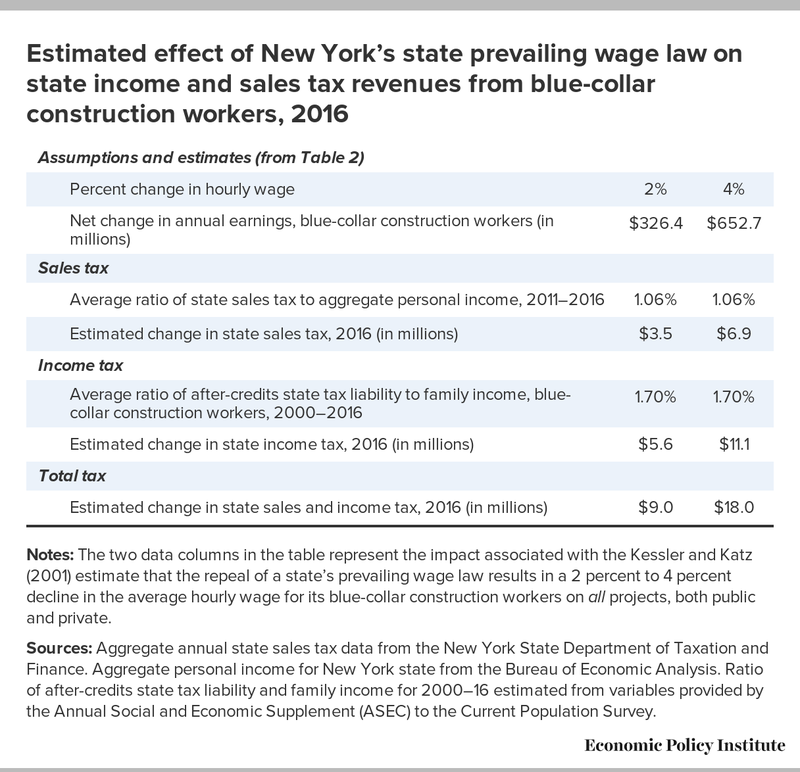 Using the aggregate state ratio of sales tax revenues to income in New York represents a conservative estimate of how earnings losses among New York’s blue-collar construction workers would affect state tax revenues. Given differences in marginal propensities to consume and save, high-income New York state residents likely devote relatively less of their aggregate income to sales tax when compared with most blue-collar construction workers. 21. Kessler and Katz (2001) outlined that high-wage employees are likely to experience more extreme income losses following the repeal of a state’s prevailing wage law when compared with low-wage employees. Given the progressive nature of New York’s income tax structure, it is likely that the income tax estimates in Table 3 underestimate the annual effect. 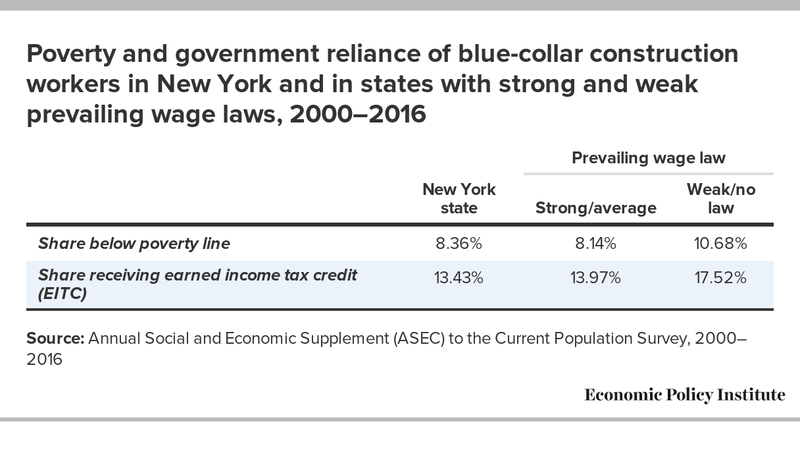 Further, a considerable percentage of New York’s blue-collar construction workers featured in the Annual Social and Economic Supplement of the Current Population Survey were estimated to have negative effective tax rates. Since it is highly unlikely that additional workplace income would further decrease the tax burden for these workers as the negative ratio would indicate, some thought was given to replacing those negative rates with zeroes in the calculation (the aggregate ratio increases from 0.0170 to 0.0198 as a result). However, given the existence of the Earned Income Tax Credit (EITC) and in the interest of keeping the estimates conservative, this study used the lower (0.0170) rate. 22. The emphasis on state and local taxes ignores the additional monies received by the federal government as a result of New York’s prevailing wage law, including income tax and workplace payments into Social Security and Medicare. 23. Using the 2000 to 2016 Annual Social and Economics Supplement (ASEC) to the Current Population Survey, workers in the construction industry accounted for 6.84 percent of individuals who were employed and were deemed to be below the poverty line. According to the Bureau of Labor Statistics Current Employment Statistics program, there were 372,900 workers employed in construction in New York state in 2016. The resulting estimate—25,500—may be conservative given that the CPS likely undercounts low-paid, undocumented workers employed in construction. 24. The “strength” of a state’s prevailing wage law was originally introduced by Thieblot (1995). This scoring system classifies state policies on the basis of five categories—minimum contract threshold, contracts covered, enforced wage rate, breadth of work covered, and an “other” category—and awards points based on established criteria. Thieblot (1995) classifies “strong” laws as those with 12+ points, “average” laws as those with 7–11 points and “weak” laws as those with 1–6 points. Belman, Ormiston, and Petty (2017) used these guidelines to reevaluate state prevailing wage laws in 1979, 1994, and 2006. For this report, the 2006 scores are used to categorize states. 25. To date, there has not been an academic study that has attempted to isolate the effect of prevailing wage laws in predicting poverty rates among blue-collar construction workers. But in a study of Ohio’s prevailing wage law, Onsarigo et al. (2017) used a cross-sectional regression model to demonstrate that, on a national level, states with a weak or nonexistent prevailing wage law had 3.1 percent higher poverty rates than states with a strong or average law. 26. Wage and salary income is measured in 2015 US dollars. 28. Fatalities in construction represented 20.5 percent of all fatalities in private industry and 18.6 percent of total fatal injuries in 2014. See “Fatal Occupational Injuries by Industry and Event or Exposure, all United States, 2014” via the Bureau of Labor Statistics at http://www.bls.gov/iif/oshwc/cfoi/cftb0286.pdf. 29. The positive safety impact of prevailing wage laws are indirectly supported by an overwhelming amount of research demonstrating that union jobsites are substantially safer than nonunion jobsites. For example, Zullo (2011) finds that fatalities in the construction industry are lower in states with greater union density. Miller et al. (2013) demonstrate that nonunion contractors commit significantly more OSHA violations than their union counterparts in Missouri. Better safety records among union contractors is the result of a number of factors, including better worker training (Bilginsoy 2005), more stringent awareness and enforcement of OSHA requirements at union worksites (Weil 1992) and a workplace culture that more greatly emphasizes safety concerns (Gillen et al. 2002). 30. While California state prevailing wage laws govern state and locally financed public projects, “charter cities” are able to choose to exempt themselves from paying prevailing wage rates (Kim, Kuo-Liang, and Philips 2012). This led the authors to be able to compare projects built under prevailing wage provisions and those projects that were exempt from the law. 31. If prevailing wage laws discourage some low-road contractors from bidding on a public project, the results of Kim, Kuo-Liang and Philips (2012) and Duncan (2015a) would indicate that either (a) the reduction in the number of bids by low-road contractors is sufficiently small so as to not be statistically significant or (b) this reduction is offset by increased bidding from other high-road contractors. 32. On page 16 of its report, the Empire Center implicitly suggests that New York’s prevailing wage law is racially discriminatory given that it advantages labor unions. The Empire Center’s implied position is contradicted by a volume of academic-caliber studies that has thoroughly debunked the hypothesis that state prevailing wage laws have any discriminatory effect (Kessler and Katz 2001; Azari-Rad, Philips, and Prus 2003; Belman 2005; Manzo, Duncan and Lantsberg 2015; Belman, Ormiston, and Petty 2017). Further, in a non-academic examination of the data on New York City construction workers from the Bureau of Labor Statistics, Mishel (2017) demonstrates that claims that New York’s unions are discriminatory are historically anachronistic; as an example, African-Americans were more represented in the union construction workforce (21.2 percent) than the nonunion sector (15.8 percent) between 2006 and 2015. Atalah, Alan. 2013a. “Comparison of Union and Non-Union Bids on Ohio School Facilities Commission Construction Projects.” International Journal of Economics and Management Engineering, Vol. 3, Issue 1, pp. 29-35. Atalah, Alan. 2013b. “Impact of Prevailing Wages on the Cost among the Various Construction Trades.” Journal of Civil Engineering and Architecture, Vol. 7, No. 6, pp. 670-676. Azari-Rad, Hamid. 2005. “Prevailing Wage Laws and Injury Rates in Construction.” In Hamid Azari-Rad, Peter Philips, and Mark Prus (Eds. ), The Economics of Prevailing Wage Laws, pp. 169–187. Aldershot, UK: Ashgate. Azari-Rad, Hamid, and Peter Philips. 2003. “Race and Prevailing Wage Laws in the Construction Industry: Comment on Thieblot.” Journal of Labor Research, Vol. 24, 161-168. Azari-Rad, Hamid, Peter Philips, and Mark Prus. 2002. “Making Hay When It Rains: The Effect Prevailing Wage Regulations, Scale Economies, Seasonal, Cyclical and Local Business Patterns Have On School Construction Costs.” Journal of Education Finance, Vol. 27, 997-1012. Azari-Rad, Hamid, Peter Philips, and Mark Prus. 2003 ‘State Prevailing Wage Laws and School Construction Costs.’ Industrial Relations, Vol. 42, No. 3, pp. 445-457. Belman, Dale. 2005. “Prevailing Wage Laws, Unions, and Minority Employment in Construction.” In Hamid Azari-Rad, Peter Philips, and Mark Prus (Eds. ), The Economics of Prevailing Wage Laws, pp. 101–119. Aldershot, UK: Ashgate. Belman, Dale, Russell Ormiston, and Ryan Petty. 2017. “The Effect of State Prevailing Wage Laws on African-American Employment in Construction.” Unpublished working paper. Bernhardt, Annette, Michael Spiller, and Diana Polson. 2013. “All Work and No Pay: Violations of Employment and Labor Laws in Chicago, Los Angeles and New York.” Social Forces, Vol. 91, No. 3, pp. 725-746. Bilginsoy, Cihan. 2005. “Wage Regulation and Training: The Impact of State Prevailing Wage Laws on Apprenticeship,” in Hamid Azari-Rad, Peter Philips and Mark J. Prus (eds.) The Economics of Prevailing Wage Laws, pp. 149-168. Aldershot, UK: Ashgate. Bilginsoy, Cihan and Peter Philips. 2000. ‘Prevailing Wage Regulations and School Construction Costs: Evidence from British Columbia.’ Journal of Education Finance, Vol. 24, pp. 415-432. Brennan Center for Justice. 2007. “Unregulated Work in the Construction Industry in New York City.” Accessed at: https://www.brennancenter.org/sites/default/files/legacy/d/download_file_49377.pdf. Bureau of Labor Statistics, Occupational Employment Statistics (BLS OES). Various years. OES Data [online data tables]. California Department of Housing and Community Development, California Tax Credit Allocation Committee, California Housing Finance Agency, and California Debt Limit Allocation Committee. 2014. “Affordable Housing Cost Study.” Accessed at: http://www.treasurer.ca.gov/ctcac/affordable_housing.pdf . Dickson Quesada, Allison, Frank Manzo, Dale Belman, and Robert Bruno. 2013. “A Weakened State: The Economic and Social Impacts of Repeal of the Prevailing Law in Illinois.” Labor Education Program, School of Labor and Employment Relations, University of Illinois at Urbana-Champaign. Accessed at: https://ler.illinois.edu/wp-content/uploads/2015/01/PWL_policy-brief_spreads041.pdf. Donahue, Linda H., James Ryan Lamare, and Fred B. Kotler. 2007. “The Cost of Worker Misclassification in New York State.” Digital Commons at Cornell University, School of Industrial and Labor Relations. Accessed at: http://digitalcommons.ilr.cornell.edu/reports/9/. Duncan, Kevin. 2015a. “The Effect of Federal Davis-Bacon and Disadvantaged Business Enterprise Regulations on Highway Maintenance Costs.” Industrial and Labor Relations Review, Vol. 68, No. 1, pp. 212-237. Duncan, Kevin. 2015b. “Do Federal Davis-Bacon and Disadvantaged Business Enterprise Regulations Affect Aggressive Bidding? Evidence from Highway Procurement Auction,” Journal of Public Procurement, Vol. 15, Issue 3, pp. 291-316. Duncan, Kevin and Alex Lantsberg. 2015. “Building the Golden State: The Economic Impacts of California’s Prevailing Wage Policy.” Accessed at: http://www.smartcitiesprevail.org/2015/04/14/study-prevailing-wage-adds-17-5k-jobs-california-economy/. Duncan, Kevin, and Russell Ormiston. 2018. “What Does the Research Tell Us About Prevailing Wage Laws?” Labor Studies Journal, forthcoming. Duncan, Kevin, Peter Philips, and Mark Prus. 2014. “Prevailing Wage Regulations and School Construction Costs: Cumulative Evidence from British Columbia.” Industrial Relations, Vol. 53, No. 4, October, pp. 593-616. Dunn, Sarah, John Quigley, and Larry Rosenthal. 2005. “The Effects of Prevailing Wage Regulations on the Cost of Low-Income Housing,” Industrial and Labor Relations Review, Vol. 59, No. 1, pp. 141-157. Flood, Sarah, Miriam King, Steven Ruggles, and J. Robert Warren. 2017. Integrated Public Use Microdata Series, Current Population Survey: Version 5.0. . Minneapolis: University of Minnesota. https://doi.org/10.18128/D030.V5.0. Gardner, Kent, and Rochelle Ruffer. 2008. “Prevailing Wage in New York State.” Published by the Center for Governmental Research. Gillen, Marion, David Baltz, Margy Gassel, Luz Kirsch, and Diane Vaccaro. 2002. “Perceived Safety Climate, Job Demands, and Coworker Support among Union and Nonunion Injured Construction Workers.” Journal of Safety Research, Vol. 33, No. 1, pp. 33-51. Accessed at: http://www.sciencedirect.com/science/article/pii/S0022437502000026. Gujarati, Damodar. 1967. “The Prevailing Wage Law in the USA,” Indian Journal of Industrial Relations, Vol. 2, No. 4, pp. 514-520. Kelsay, Michael. 2016. “The Adverse Economic Impact from Repeal of the Prevailing Wage Law in Missouri.” Accessed at: http://www.faircontracting.org/PDFs/prevailing_wages/The%20Adverse%20Economic%20Impact%20from%20Repeal%20of%20the%20Prevailing%20Wage%20Law%20in%20Missouri.pdf. Kessler, Daniel and Lawrence Katz. 2001. “Prevailing Wage Laws and Construction Labor Markets,” Industrial and Labor Relations Review, Vol. 54, No. 2, pp. 259-274. Kim, Jaewhan, Chang Kuo-Liang, and Peter Philips. 2012. “The Effect of Prevailing Wage Requirements on Contractor Bid Participation and Behavior: A Comparison of Palo Alto, California with Four Nearby Prevailing Wage Municipalities.” Industrial Relations, Vol. 51, No. 4, pp. 874-891. Leef, George. 2010. “Prevailing Wage Laws: Public Interest or Special Interest Legislation?” Cato Journal, Vol. 30, No. 1, pp. 137-154. Littlehale, Scott. 2017. “Revisiting the Costs of Developing New Subsized Housing.” Berkley Planning Journal. Forthcoming. Maiti, Abhradeep, and Debarshi Indra. 2016. “Regional Variations in Labor Demand Elasticity: Evidence from U.S. Counties.” Journal of Regional Science, Vol. 56, No. 4, pp. 635-658. Manzo, Frank, Alex Lantsberg, and Kevin Duncan. 2015. “The Economic, Fiscal, and Social Impacts of State Prevailing Wage Laws: Choosing Between the High Road and the Low Road in the Construction Industry.” Unpublished working paper. Milkman, Ruth, Ana Luz Gonzalez, and Peter Ikeler. 2012. “Wage and Hour Violationsin Urban Labour Markets: A Comparison of Los Angeles, New York and Chicago.” Industrial Relations Journal, Vol. 43, No. 5, pp. 378-398. Miller, Harry, Tara Hill, Kris Mason, and John Gaal. 2013. “An Analysis of Safety Culture & Safety Training: Comparing the Impact of Union, Non-Union, and Right-to-Work Construction Venues.” Online Journal of Workforce Education and Development, Vol. VI, No. 2. Minnesota Office of the Legislative Auditor. 2007. “Evaluation Report: Prevailing Wages.” Accessed at: http://www.auditor.leg.state.mn.us/ped/pedrep/prevailingwages.pdf. Mishel, Larry. 2017. “Diversity in the New York City Union and Nonunion Construction Sectors.” Economic Policy Institute. Accessed at: http://www.epi.org/publication/diversity-in-the-nyc-construction-union-and-nonunion-sectors/. Mukhopadhyay, Sankar, Thomas Harris and Nathan Wiseman. 2013. “A Report on the Direct and Indirect Effects of Prevailing Wage Legislations on Society.” Accessed at: http://www.faircontracting.org/wp-content/uploads/2014/05/A-Report-on-the-Direct-and-Indirect-Effects-of-Prevailing-Wage-Legislations-on-Society.pdf. Ohio Legislative Service Commission, “The Effects of the Exemption of School Construction Projects From Ohio’s Prevailing Wage Law, S.B. 102 Report, Staff Research Report No. 149, May 20, 2002. Accessed at: http://www.lsc.ohio.gov/research/srr149.pdf. Onsarigo, Lameck, Alan Atalah, Frank Manzo IV, and Kevin Duncan. 2017. “The Economic, Fiscal, and Social Effects of Ohio’s Prevailing Wage Law,” Accessed at: https://midwestepi.files.wordpress.com/2016/05/bowling-green-su-kent-state-ohio-pw-study-4-10-17.pdf. Palm, Matthew and Deb Niemeier. 2017. “Does Placing Affordable Housing Near Rail Raise Development Costs? Evidence from California’s Four Largest Metropolitan Planning Organizations.” Housing Policy Debate. Accessed online at: https://doi.org/10.1080/10511482.2017.1331367. Philips, Peter. 1998. “Kansas and Prevailing Wage Legislation.” Accessed at: http://www.faircontracting.org/PDFs/prevailing_wages/kansas_prevailing_wage.pdf. Philips, Peter. 2014. “Kentucky’s Prevailing Wage Law: An Economic Impact Analysis.” Accessed at: http://www.faircontracting.org/wp-content/uploads/2014/02/Kentucky-Report-2014-Philips.pdf. Philips, Peter, Garth Mangum, Norm Waitzman, and Anne Yeagle. 1995. “Losing Ground: Lessons from the Repeal of Nine “Little Davis-Bacon” Acts.” Accessed at: http://www.faircontracting.org/PDFs/prevailing_wages/losingground.pdf. Prus, Mark. 1999. “Prevailing Wage Laws and School Construction Costs: An Analysis of Public School Construction in Maryland and the Mid Atlantic States.” Accessed at: http://eric.ed.gov/?id=ED456630. Theodore, Nik, Abel Valenzuela and Edwin Melendez. 2006. “La Esquina (the corner): Day Laborers on the Margins of New York’s Formal Economy.” Working USA, Vol. 9, pp. 407-23. Thieblot, Armand. 1995. “State Prevailing Wage Laws: An Assessment at the Start of 1995,” Rosslyn, Va.: State Relations Department, Associated Builders and Contractors. Cost of Public School Construction,” Journal of Education Finance, Vol. 35, No. 4, pp. 313-330. Vitaliano, Donald. 2002. “An Econometric Assessment of the Economic Efficiency of State Departments of Transportation,” International Journal of Transportation Economics, Vol. 29, No. 2, pp. 167-180. Vitullo-Martin, Julia. 2012. “The Complex Worlds of New York Prevailing Wage.” Published by the Center for Urban Real Estate. Accessed at: http://www.nysafah.org/cmsBuilder/uploads/The-Complex-World-of-Prevailing-Wage.pdf. Weil, David. 1992. “Building safety: The Role of Construction Unions in the Enforcement of OSHA.” Journal of Labor Research, Vol. 13, Issue 1, pp. 121-132. Weinberg, Edgar. 1969. “Reducing Skill Shortages in Construction.” Monthly Labor Review, Vol. 92, No, 2, pp. 3-9. Yildirim, Yildiray, and Eunkyu Lee. 2016. “The Impact of Prevailing Wages on Construction Project Costs in NYC.” Published by the Newman Real Estate Institute. Accessed at: http://www.baruch.cuny.edu/realestate/research-publishing/documents/NREI_PrevailingWage_October2016_110316.pdf. Zullo, Rolland. 2011. “Right-to-Work Laws and Fatalities in Construction.” Ann Arbor, MI: Institute for Research on Labor, Employment, and the Economy, University of Michigan. Accessed at: http://irlee.umich.edu/wp-content/uploads/2016/05/RightToWorkLawsAndFatalitiesInConstruction.pdf.